The genus Streptococcus comprises a heterogeneous group of bacteria that have an important role in medicine and industry. These microorganisms are Gram-positive, cocci, 0.6–1.2 µm diameter, not motile, do not form spores, are catalase-negative and grow in pairs or chains . Rebecca C. Lancefield, in her work in the early 1930s, systematized the classification of streptococci based on the presence and type of surface antigen: cell wall polysaccharide or lipoteichoic acid . S. agalactiae is classified as Lancefield group B (GBS) based on the presence of a polysaccharide in the cell wall. This polysaccharide is composed of galactose, N-acetylglucosamine, rhamnose and glucitol phosphate .Currently, ten serotypes are described for this species (Ia, Ib, II-IX) and occasionally some strains can be non-serotypeable . 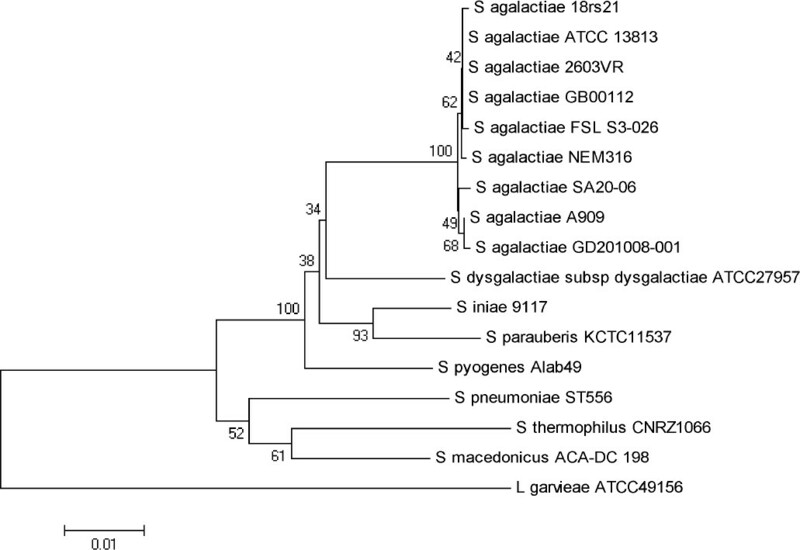 Major human and animal streptococcal pathogens belong to the pyogenic group of β-hemolytic streptococci . In this context, the β-hemolytic bacteria S. agalactiae, deserves attention for causing diseases in a broad range of homeothermic and heterothermic hosts , although this bacteria is also a common member of the gastrointestinal tract microbiota . Streptococcus agalactiae SA20-06 was obtained from the AQUAVET (Laboratory of Aquatic Animal Diseases) bacterial collection, streaked onto 5% sheep blood agar and incubated at 28°C for 48 h. After that, cells were grown in 150mL brain-heart-infusion broth (BHI-HiMedia Laboratories Pvt. Ltda, India) under agitation (150 rpm), at 28°C. Genomic DNA was obtained by using phenol-chloroform-isoamylic alcohol extraction protocol using micro-wave oven . The genome sequencing of S. agalactiae SA20-06 was performed using the SOLiD v3 Plus and SOLiD 5500 platforms (Applied Biosystems) with two mate-paired libraries (both with 1–2 kb insert size), which generated 50,223,637 and 283,953,694 reads of 50 bp and 60 bp in size, respectively. After sequencing, the reads were subjected to quality filtering using the qualityFilter.pl script (a homemade script), in which reads with an average Phred quality of less than 20 were removed, and error sequence correction was performed with SAET software (Life Technologies). After quality analysis, 210,004,694 reads were used in the assembly, which generated a genome coverage corresponding to ∼5,700× genome coverage based on the reference genome of 2,127,839 bp size of S. agalactiae strain A909 (NC_007432). 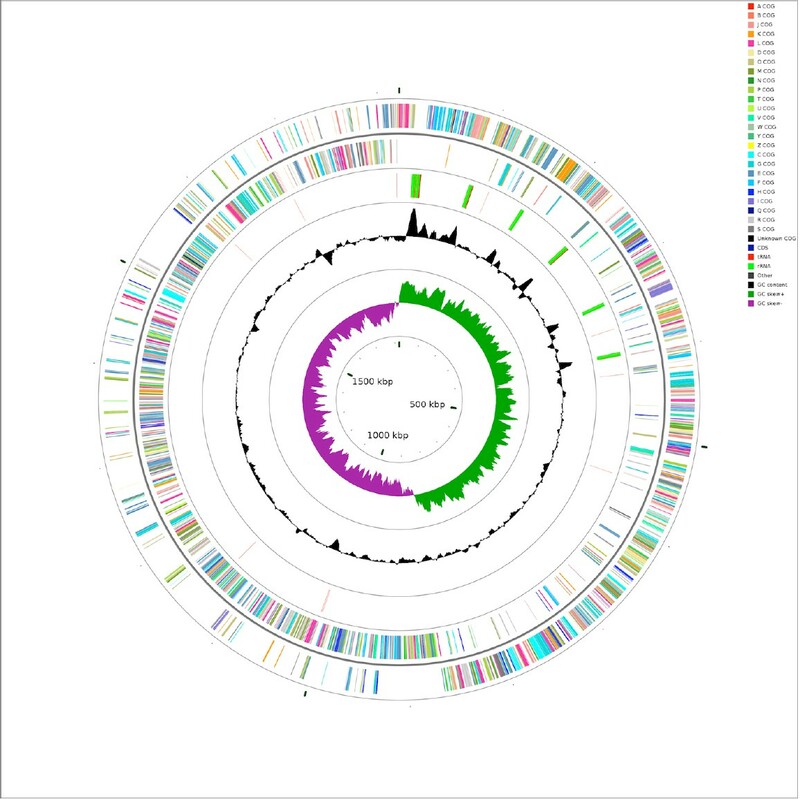 The genome sequence of SA20-06 was assembled based on the hybrid strategy using CLC Genome Workbench 4.9, Velvet  and Edena  software. A total of 872 contigs were generated, with N50 of 5,221 bp and the smallest contig having 201 bp. Due to the hybrid assembly methodology, the redundant contigs were removed using the Simplifier software . The contigs were mapped against the reference genome (strain A909) using BLASTn, and the results were analyzed using G4ALL software , to extend the contigs and identify overlaps of a minimum of 30 bp between the ends of the contigs, thus yielding larger contigs.